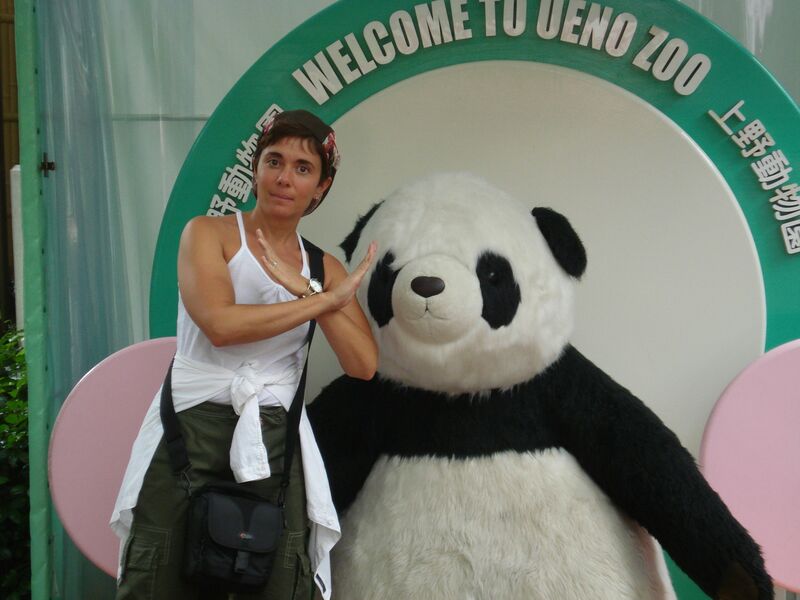 Let’s Take a Side Trip…to Japan! A Mountain, A Monk, and…Gorillas??? 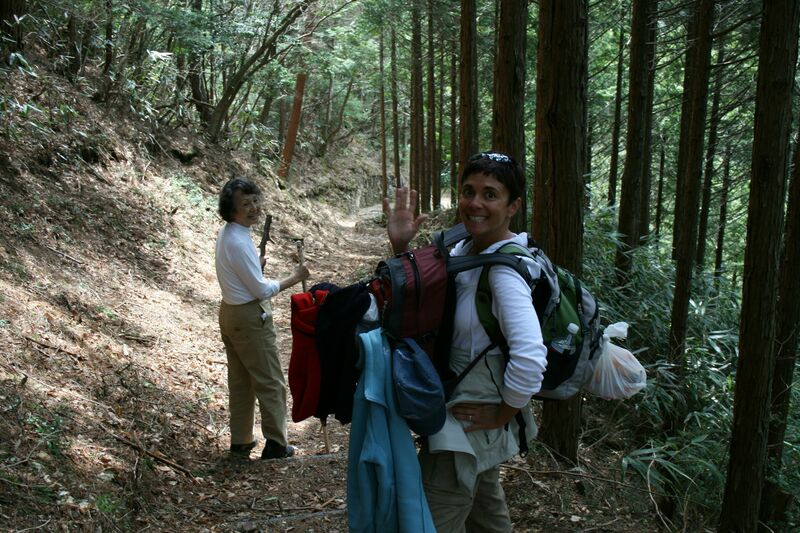 My mother-in-law (who is originally from Japan) thought a 4-day hike across the sacred mountains of Koyasan in Japan was the perfect way to celebrate her 77th birthday, starting with a stay at Haryoin Temple. We realized we didn’t pack warm enough for the hike, so we walked into town to get thermal underwear. As I cannot read Japanese, my mom-in-law picked out my package of long johns. Back in our temple room I tried on the underwear, to find out they were so big I could pull them up to my neck. Standing there in nothing but underwear pulled up to my neck (sorry, no photo) I heard a tap on the door; expecting it to be my mom-in-law and posing for her so we could have a good laugh I stated “dozo” (welcome, come in). To my great surprise, it was the temple’s head monk that walked in the door! In very Buddhist fashion, he made no notice of my ridiculous attire and proceeded in his task of lighting the incense in our room – but I was mortified! There are so many funny “culture shock” stories from this trip. A few of them are captured in the photos above (e.g., the toilet, the KFC). Another happened on one of the occasions where we would get home sick and try to do something we would do back home (like make “Mexican” food [with soy beans] or go to a cheesy matinee [36$ lesson]). We decided to go to a gym and work out. Just trying to be allowed in took 2 days as we could never seem to bring the proper equipment with us (second pair of clean shoes, bathing cap, etc.). But the really hysterical part of the story happened the day we finally did work out. As we learned, Japanese people like to work out with the heater cranked. Combine that with my run on a treadmill and I was HOT and thirsty! I kept trying to find a water fountain, but to no avail. Finally, across the gym by the weights I spotted it – the ubiquitous vending machine…I was saved! I hurried to the machine expecting to find water and all sorts of wonderfully strange exercise beverages. 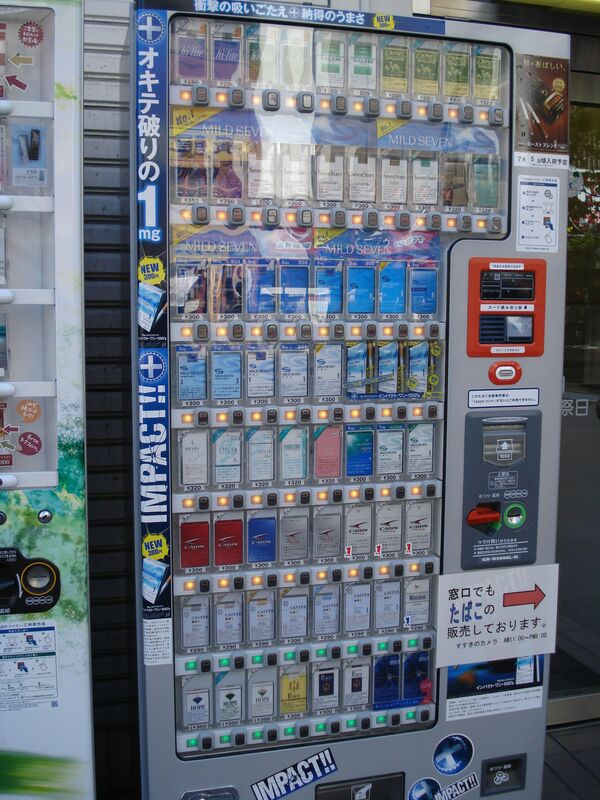 Instead, right there, in the middle of a GYM, was a vending machine filled with….. CIGARETTES!! !